Tens of thousands of teenagers from across the country weren’t the only people who made their way to Indianapolis for the National Catholic Youth Conference (NCYC), which took place on Nov. 21-23 in the Indiana Convention Center and Lucas Oil Stadium. Some 216 representatives of 62 religious communities in the United States also participated in the biennial Catholic youth event. They interacted with teens in a variety of settings in two large exhibit halls in the Indiana Convention Center that had been turned into a thematic park called “Inspiration Junction.” It was a place where Catholic teens could create arts and crafts projects, put together meals for those in need, listen to Catholic musicians sing or pray in a variety of settings. Representatives of different religious communities worked together in groups as they helped the teens in the thematic park. Sacred Heart Brother Ronald Hingle of Baton Rouge, La., chairman of the board of the National Religious Vocations Council, stood in the midst of Inspiration Junction on Nov. 21 and liked what he saw. Two years earlier at NCYC, religious orders had booths in one part of the connected exhibit halls. Brother Ronald thinks the changed approach this year reflects the place of religious life among the faithful. Katie Allie, 16, of Cornelius, Ore., first attended NCYC two years ago. She saw the change in how religious were a part of the event this year. That impression was able to be shaped in a special way in the thematic park at “Vocations Got Talent.” Throughout the three-day conference, seminarians, deacons, priests and religious showed off their talents and shared their vocation stories in an area organized by the vocations office of the Archdiocese of Indianapolis and religious orders in central and southern Indiana. 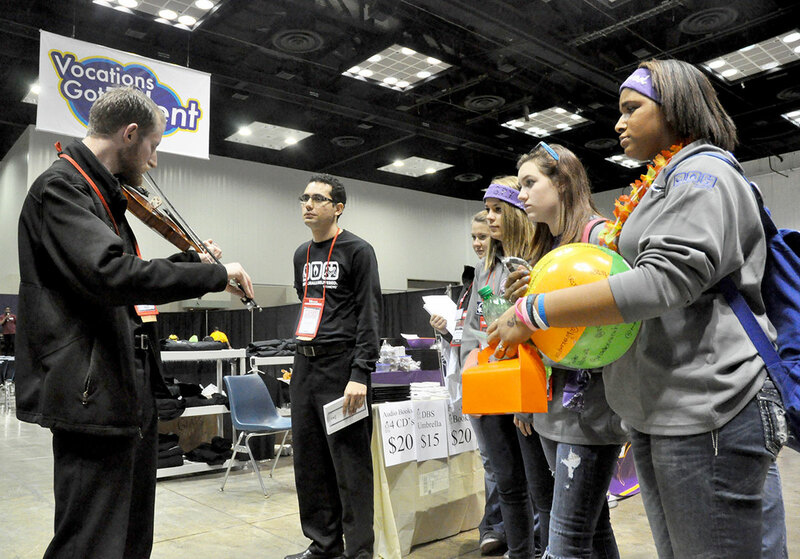 Archdiocesan vocations director Father Eric Augenstein said “Vocations Got Talent” showed the teens at the conference that people who discern a priestly or religious vocation have multifaceted lives beyond the ministries that they might see them involved in. Frances Seaton was attending the conference from Owensboro, Ky. After listening to transitional Deacon Daniel Bedel of the Archdiocese of Indianapolis play the violin, she talked about how she has an aunt who is an Ursuline sister and a cousin who is a priest. She is considering religious life herself. Teens at NCYC who wanted to have conversations with the religious at the conference could go from the often raucous thematic park to a quiet corner of the Vocations Nook, furnished with couches and easy chairs. Alexandra Desrosiers, 16, of Belleville, Ill., chatted with Brother Ronald in the Vocations Nook. She appreciated how the religious at the conference were available to the teens and that a lot of teens were talking with them about vocations to consecrated life. “I think it’s really cool because, personally, you think of Church figures as people you really can’t talk to,” said Alexandra. “Seeing them here interacting with all of us and explaining to us about what they do is really nice. Alexandra was joined in her appreciation by Providence Sister Theresa Clare Carr who stood in the middle of the thematic park taking in the thousands of teens who made their way through the exhibit halls, often taking time to chat with her and other religious. “It’s been very heartwarming to see so many kids,” Sister Theresa Clare said. “When we approach them, they’re all smiles. They’re happy to be here. We’ve met so many, from Connecticut and Baltimore to New Mexico and California.